In the past few months, we have been giving away various devices in what I dubbed the "Giant Giveaway" series. Despite having given away 3 tablets (the XOOM, the G-Slate, and the Tab 10.1) already, we're not planning on slowing down; in fact, we're going to accelerate the giveaway process. Rather than keep the giveaways open for 2 weeks, we're going to run them for only about 5-7 days instead, as otherwise our shelves will collapse under the weight of all the goodies and ruin them, and we don't want that, do we? In the spirit of letting you guys in on the best gadgets the market has to offer, today we are excited to announce that the prize for this week's giveaway will be the 32GB Samsung Galaxy Tab 10.1, Wi-Fi edition (up from the 16GB version in the last giveaway). This time, the giveaway is sponsored by Beansoft, the developer behind our favorite Thumb Keyboard, which you can see pictured below. I have been personally using Thumb Keyboard on all my tablets (where it truly shines with its split-key layout) and phones, and yes, I've tried SwiftKey, Swype, FlexT9, HTC stock, Gingerbread stock, and many other keyboards, and I keep coming back to Thumb Keyboard (the text shortcuts functionality is pure gold). Alternatively, if the Amazon Appstore is your thing, you can grab the keyboard from there. But enough about Thumb Keyboard, let's get to business. More great prizes are coming up shortly, so be sure to keep following Android Police on Twitter, Facebook, Google Plus, and RSS (and if you're in a good mood, click the +1 button in the top left corner of this page!). 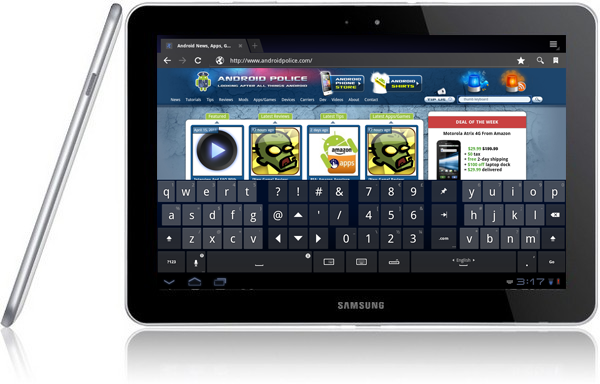 A brand new 32GB Samsung Galaxy Tab 10.1 Wi-Fi Honeycomb tablet, courtesy of Thumb Keyboard from Beansoft and Android Police. This contest is now over. We have selected the winner - see if it's you here. Entering the giveaway is really simple. There are 2 steps - complete both of them. Complete either one of these to be eligible, two to double, or all 3 to triple your chances of winning. Add this account to at least one circle on Google+, then re-share this message with the Public circle by clicking Share. Like the AndroidPolice fan page on Facebook. There is no need to leave a comment to enter, so if you're already following, proceed to step 2 below. Fill out this brief form so that we know how to get in touch with you in case you win. The giveaway starts immediately and runs until July 24th, 11:59PM PST. It is open to residents of the countries specified in the detailed terms and conditions below (not just U.S. - check the list to see if your country is there). The winner will be selected randomly from the pool of entrants, announced here, and notified via email. 1 entry per person for each method is allowed (1 for Facebook, 1 for Twitter, and 1 for Google Plus). Entering more than once on any of the social sites will not increase your chances. Beansoft and Android Police will ship the prize to the winner. See the "Official Rules" below for the exact terms of the contest and eligibility requirements. International entrants: Please ensure your country is listed in "1. Eligibility" of the Official Rules, and particularly remember that you will be responsible for any and all import duties, fees, taxes, or other costs (excluding the shipping carrier charge) associated with importing the device into your country, as indicated in "4. Prizes"
ANDROIDPOLICE.COM, A CALIFORNIA SOLE PROPRIETORSHIP (referred to herein as “Contest Provider”) IS THE PROVIDER OF THIS CONTEST. THIS CONTEST IS OPEN ONLY TO RESIDENTS OF THE UNITED STATES, CANADA, MEXICO, CHILE, AUSTRALIA, NEW ZEALAND, SINGAPORE, INDIA, FRANCE, BELGIUM, THE UNITED KINGDOM, LUXEMBOURG, GERMANY, AUSTRIA, SWITZERLAND, SWEDEN, FINLAND, DENMARK, NORWAY, SPAIN, IRELAND, RUSSIA, THE NETHERLANDS, SOUTH KOREA, SOUTH AFRICA, TAIWAN, ITALY, PORTUGAL, SLOVENIA, MALAYSIA, VIETNAM, THE PEOPLE'S REPUBLIC OF CHINA, THE CZECH REPUBLIC, CROATIA, THE UKRAINE, POLAND, BULGARIA, AND HUNGARY WHICH ARE: (i) OVER THE AGE OF MAJORITY IN THEIR COUNTRY OF RESIDENCE ON THE DATE REFERENCED BELOW AS THE START DATE FOR THE CONTEST; AND (ii) WHO ARE NOT RESIDENTS OF THE STATE OF RHODE ISLAND IN THE UNITED STATES; THE PROVINCE OF QUEBEC, CANADA; OR RESIDENTS OF THE AUSTRALIAN STATES OF VICTORIA, QUEENSLAND OR THE AUSTRALIAN CAPITAL TERRITORY ("ENTRANTS"). If you are under the legal age of majority in your country of residence, but are (i) over the age of 13 years of age and a resident of the United States of America, or a member country of the European Union other than Spain, or the United Kingdom; (ii) who is least 14 years of age and a resident of Spain, the United Kingdom, or Russia; or (iii) who is at least 15 years of age and is a resident of the Republic of Korea; one of your parents or legal guardians must submit a signed, written statement that they have read, understood and agree to these Contest rules with your entry, and that such agreement constitutes acceptance of these Contest rules on behalf of you and themselves. Residents of the State of Rhode Island in the United States, the Province of Quebec in Canada, or Queensland, Victoria, or the Australian Capital Territory in Australia are ineligible for participation in this Contest. All applicable federal, state and local laws and regulations apply. There is no cost to enter or win. Offer void where prohibited. Contest Provider will not be responsible for: (a) any late, lost, or misrouted transmissions or entries; (b) any Contest disruptions, injuries, losses or damages caused by events beyond the control of Contest Provider; or (c) any printing or typographical errors in any materials associated with the Contest. The Contest begins July 19th, 2011 at 00:01AM Pacific Time and will continue until July 24th, 2011 at 11:59PM Pacific Time (the "Deadline"). All entries must be received before the Deadline to be eligible to win the Prize. One (1) eligible entrant will be chosen by the Contest Provider as the “Winner,” and will receive the “Prize,” one (1) SAMSUNG “GALAXY TAB 10.1” 32GB Wi-Fi tablet computing device, estimated retail value $599.99. No substitutions or exchanges, cash or otherwise, will be allowed. Prize is not transferable. The Prize will be provided “as is,” Contest Provider and Prize Provider provide no warranties of any kind, express or implied, including any implied warranties of merchantability or fitness for a particular purpose. ALL FEDERAL, STATE AND LOCAL TAXES ASSOCIATED WITH THE RECEIPT OR USE OF THE PRIZE ARE THE SOLE RESPONSIBILITY OF THE WINNER. Shipment of Prize will be the sole responsibility of Prize Provider. Shipment method and carrier will be selected by Prize Provider. Contest Provider and Prize Provider assume no responsibility for loss of or damage to the prize prior to or during shipment. If the Prize, after shipment, is returned to the Prize Provider as undeliverable or for any other reason, Contest Provider and Prize Provider reserve the right to disqualify the Winner and to designate another Entrant as the Winner. The Contest entry requires you to submit a first and last name, email address, and shipping address to meet the Contest’s Eligibility requirements. If you are a citizen of France and/or any of the other countries whose citizens are eligible for this Contest, and pursuant to French law pertaining to data collection and processing, you are informed that the data collector is AndroidPolice.com, and the data collected will be transferred to the United States of America. Upon request, you will be provided with access to your personal data. To exercise this right, please contact [email protected]. The Winner consents to allowing Contest Provider to disclose the following information to Prize Provider for the purpose of awarding the Prize: (1) first and last name, (2) email address, and (3) shipping address. Shipping address must be located in one of the countries or regions listed in the Eligibility section. Failure to provide an address in one of the countries or regions listed in the Eligibility section will result in disqualification from the Contest. By entering the Contest, you release the Contest Provider and Prize Provider from any liability whatsoever, and waive any and all causes of action, related to any claims, costs, injuries, losses, or damages of any kind arising out of or in connection with the Contest or delivery, misdelivery, acceptance, possession, use of or inability to use the Prize. As a condition of being awarded the Prize, the Winner will be required to execute and deliver to Contest Provider a signed Affidavit of Eligibility, which includes an acceptance of these Official Rules and a release of liability. The Affidavit of Eligibility may be submitted by email. Contest provided by Android Police. Prizing provided by Beansoft. Any questions regarding the Contest should be directed via e-mail to Artem Russakovskii at [email protected]. The Contest and these Official Rules will be governed, construed and interpreted under the laws of the United States. Entrants agree to be bound by these Official Rules and by the decisions of the Contest Provider, which are final and binding in all respects. Contest Provider reserves the right to change these Official Rules at any time, at its discretion, and to suspend or cancel the Contest or any entrant's participation in the Contest should any causes beyond Contest Provider’s control affect the administration, security or proper play of the Contest or Contest Provider otherwise becomes (as determined by its discretion) unable to run the Contest as planned.